John Wilson has died in Thailand. Credit: ITV News Anglia. 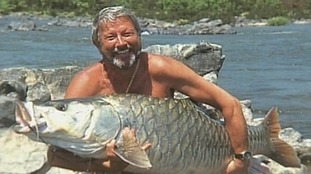 A Norfolk television, radio and fishing legend, once voted "the greatest angler of all time", has died at his home in Thailand. John Wilson spent years bringing fishing to millions through his programmes, including Anglia's Go Fishing. Today his family confirmed the broadcaster had died in Thailand, where he had lived since 2013. Mr Wilson, who was born in 1943 and spent much of his life in Lenwade near Norwich, had a stroke on Sunday and passed away this morning, Tuesday 13 November at 4.30am. This video report was broadcast on ITV Anglia in 1999 when John published his autobiography "Fifty Years A Fisherman"
Watch an episode of Go Fishing with John Wilson from May 1994 here.